In many ways, the Northern soldier in the Civil War fought as if he had never left home. On campsites and battlefields, the Union volunteer adapted to military life with attitudes shaped by networks of family relationships, in units of men from the same hometown. Understanding these links between the homes the troops left behind and the war they had to fight, writes Reid Mitchell, offers critica… l insight into how they thought, fought, and persevered through four bloody years of combat. In The Vacant Chair, Mitchell draws on the letters, diaries, and memoirs of common soldiers to show how mid-nineteenth-century ideas and images of the home and family shaped the union soldier's approach to everything from military discipline to battlefield bravery. For hundreds of thousands of "e;boys,"e; as they called themselves, the Union army was an extension of their home and childhood experiences. Many experienced the war as a coming-of-age rite, a test of such manly virtues as self-control, endurance, and courage. They served in companies recruited from the same communities, and they wrote letters reporting on each other's performance--conscious that their own behavior in the army would affect their reputations back home. So, too, were they deeply affected by letters from their families, as wives and mothers complained of suffering or demanded greater valor. Mitchell also shows how this hometown basis for volunteer units eroded respect for military rank, as men served with officers they saw as equals: "e;Lieut Col Dewey introduced Hugh T Reid,"e; one sergeant wrote dryly, "e;by saying, 'Boys, behold your colonel,' and webeheldhim. "e; In return, officers usually adopted paternalist attitudes toward their "e;boys"e;--especially in the case of white officers commanding black soldiers. Mitchell goes on to look at the role of women in the soldiers' experiences, from the feminine center of their own households to their hatred of Confederate women as "e;she-devils. "e;The intimate relations and inner life of the Union soldier, the author writes, tell us much about how and why he kept fighting through four bloody years--and why demoralization struck the Confederate soldier as the war penetrated the South, threatening his home and family while he was at the front. "e;The Northern soldier did not simply experience the war as a husband, son, father, or brother--he fought that way as well,"e; he writes. "e;That was part of his strength. The Confederate soldier fought the war the same way, and, in the end, that proved part of his weakness. 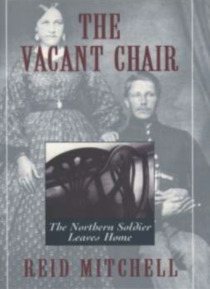 "e; The Vacant Chair uncovers this critical chapter in the Civil War experience, showing how the Union soldier saw--and won--our most costly conflict.